Apollo ... April fools day on a lunar calendar ??? Oh great you don't believe we landed on the moon either? Tin Foil Hat Brigade. Nobody was/is fooling anybody, Wolfgang. EVERY SINGLE CONSPIRACY THEORY-laden objection or skepticism about the reality of the moon landing has been answered completely and without rebuttal from the theorists who launched it. For example, why no stars in the pics taken by the astronauts? Photography 101: Had the shutter speed on the images they captured been long enough to expose for the small bits of light from the stars, then every moon-based object caught in those images - e.g. the mood lander or other astronauts - would have been pure white, completely washed out by over-exposure. Try it with a camera of your own: Mid-day on a sunny afternoon, find a shady spot adjacent to an area totally illuminated by the sun. Point the camera in such a way to include in your image both items in the shade and in the sunlight. And finally, do whatever you have to do to tell the camera to expose for the shade - i.e. so that items in the shade are properly exposed. The final result will be an image in which shaded items look right, and everything sitting in the sunlight is well overexposed. Then in the same setting, take another image, this time exposing for the sunlit items, not the shaded ones. The result will be sunlit items that look properly exposed and shaded items that are well underexposed. Now imagine doing that when the sunlit objects are a large lunar lander and astronauts in reflective suits within yards of you, and the shaded objects are pin points of light in a dark sky. When I take star pictures with my camera, I leave the shutter open 20-25 seconds per image. When I take an image of a sunlit object, I might leave the shutter open 1/1000th of a second. That's a multiplier of 20,000-25,000! OF COURSE they couldn't see stars in pictures taken on the moon . EVERY SINGLE CONSPIRACY THEORY about the moon landing has been similarly debunked. No one is fooling anyone.... But now that I think about it, someone apparently IS fooling the people who buy into those conspiracy theories. Did you even read the article? or did you just "write off all conspiracy theories" ? Did you watch the video clip of the press conferences shortly after the Apollo 11 mission involving Neil Armstrong ? Convincing ... but of what? Yes, I did read the article, which is why I know of the conspiracy theories it contains. I refuse to invest my life knocking down every conspiracy theory posted in these forums, so I chose the one from the article that was most quickly debunked. Yes, I did watch the press conference video, which to me presented the observations and reflections of astronauts who had been to the moon. Now, did you have a response specific to my photography 101 tutorial that dismantled the article's concern about the lack of stars in the photographs shot from the lunar surface? Do you have ANY reason based in science and the realities of light and photography why that tutorial doesn't dismantle the article's concern? Your explanation does not rule out other explanations of the various "photographic" unusual "coincidences" ... actually, I find the explanation in the article more convincing. The whole of the matter and the the large number of different dubious aspects of the "moon man walkiing" mission add up to the higher possibility of it having been a hoax. Ever considered that there is obviously a very convincing reason as to why no manned space missions have been conducted past tghe more immediate earth orbits ? In fact, my explanation DOES rule out what it claimed to rule out: the presence of stars in the photos the astronauts shot on the moon's surface. Due to the basic principles of photography I explained previously, there is NO WAY - none - that images of the lunar lander and its astronauts could ALSO have displayed stars. NO WAY. If you think there is such a way, please explain it. To my reading, the article offers NO such explanation. The sun was out. Remember, we landed on the bright, sun-lit side of the moon. The lack of a lunar atmosphere results in the sun's light not being scattered all around, as our planet's atmosphere does here in the daytime, but the sun WAS out when the astronauts were on the moon, and the sun WAS illuminating the surface around them. The sun is millions/billions of time brighter than any stars, which would have led to the stars not being prominent in the sky. The article offers no contrary explanation for any of the three points I have made in this or my previous post. Simply stating that a particular explanation "add(s) up to the higher possibility" does not make it so. Neither your post nor the article to which you linked offers a fact- and evidence based defense of your claim. But that's the way it is with all conspiracy theories. Ever considered that there is obviously a very convincing reason as to why no manned space missions have been conducted past the more immediate earth orbits ? Yes. It's quite simple. Our space flight agenda changed after the Apollo program. We had been to the moon, and flights to Mars or other locations in the solar system were obviously multiple decades away, if they were going to happen at all, so our space program turned to the shuttle and the International Space Station, each which flies in low earth orbit. I hope your searches for truth on the subject matter of this thread will be based on facts and evidence, not unfounded speculations and hypotheses. In my view, Wolfgang, so far, that has sadly not been the case. Well, Bill, after havnig been inside the lunar landing module exhibit myself, and having seen first hand what it actually looks like and of what materials it is supposedly made. I am rather convinced that the "manned moon landings"in 1969-1972 were a big hoax .... by the way, a position which more and more people around the world have come to conclude - and among them different scientist experts who are not under the USA propaganda influence. @Wolfgang, it's clear that you're intent on embracing the falsehood that the moon landings did not occur. Your call. For what it's worth, your personal visit to an exhibit that left you no better than "rather" convinced of your view is not, in my view, compelling evidence. But that's not surprising since almost by definition, there can be no compelling evidence of a falsehood. The final paragraph of your most recent post in my view is primarily a declaration of partisan political philosophy, and therefore content which I respect but choose not to engage given the subject of this thread. And what reason would the government have to fake these landings? One of the NASA photos is fake because the shadows of the rocks and lunar lander are not parallel. Busted The MythBusters built a small scale replica of the lunar landing site with a flat surface and a single distant spotlight to represent the Sun. They took a photo and all the shadows in the photo were parallel, as the myth proposed. They then adjusted the topography of the model surface to include a slight hill around the location of the near rocks so the shadows fell on a slope instead of a flat surface. The resulting photograph had the same shadow directions as the original NASA photograph from Apollo 14. And the reason is for faking these landings (which there is overwhelming evidence they did NOT fake them) is? @Wolfgang I think the better question and @Bill_Coley sort of alluded to this, why is it that you jump on the band wagon to EVERY conspiracy theory? I'm guess you probably think the government assassinated Kennedy as well? I am pretty sure that plenty of conspiracy theories are inaccurate theories ... but I am equally sure that some rather big events influencing the public in certain ways are not conspiracy theories but actual conspiracies. Of course, reading information which is foreign or even contradictory to one's currently held beliefs is most difficult for many ... because of unwillingness to look at the possibility that one's beloved ideas might be wrong and one may have been deceived by those whom one trusted. By the way, the same holds true in the Biblical theology field ... And for many, politics is like religion ... sacred - and what I believe is true, everything different from my belief must therefore be false. And you direct the counsel of these words ALSO to yourself, Wolfgang? Yes, of course ... by the way, most of the information in so-called "conspiracy theories" was foreign and contradictory to my initially held beliefs (which were in line with the official stories which I learned in school or from main media here). In my view, Wolfgang, truth and fact know no political system or philosophy. Whether the United States successfully sent astronauts to the surface of the moon is not a question of "good government" or "brainwashing propaganda;" it's a question of truth and fact that is settled by objective evidence. In fact, as most conspiracy theorists prove via their sparsely supported and frequently off-topic critiques, attention to issues of governance and propaganda usually distracts from and clouds objective evaluation of such evidence. On the basis of the objective information that is readily available to anyone curious enough to review it, there is NO DOUBT - none - that on multiple occasions American astronauts traveled to, landed on, and departed from the moon's surface. Your expressions of political philosophy in threads such as this one give clear voice to your social, cultural, and political points of view, but they rarely if ever demonstrate ANY defensible reason to accept your claims about the historical or current geopolitical events about which you write. Your posts in this thread - ostensibly about a moon landing - have expressed your politics, but have not at all made your case about the issue we're discussing. 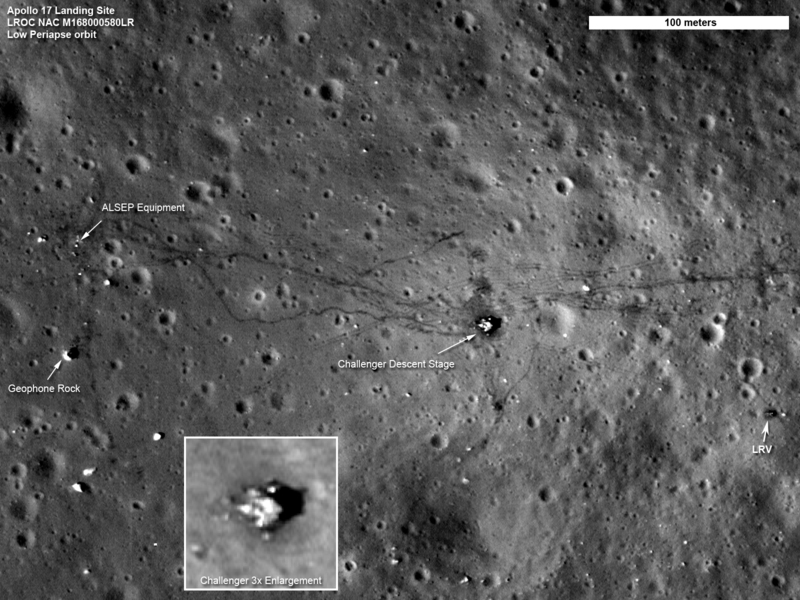 For example, how do "good government" and "brainwashing propaganda" help us understand your interpretation of the tire tracks in the lunar surface in NASA's 2011 photo to which I provided a link in a previous post? What is the factual basis - NOT the political, conjectural, or speculative basis - for your doubts about the moon landing? Please prove your case using facts and evidence - what you called "objective information" - rather than soliloquies rooted in your political philosophy. On the basis of the objective information that is readily available to anyone curious enough to review it, there is NO DOUBT - none - that on multiple occasions American astronauts traveled to, landed on, and departed from the moon's surface. For example, how do "good government" and "brainwashing propaganda" help us understand your interpretation of the tire tracks in the lunar surface in NASA's 2011 photo to which I provided a link in a previous post? And what proof is there that this picture and other rather very professional photos were taken on the moon and not in a studio? What objective information proves the NASA claims? what is the objective information about the "deadly radiation" of the "van Allen belt"? And yet again, Wolfgang, you offer political philosophy rather than facts and evidence to support your skepticism. And the fact that NO ONE among the hundreds and thousands of men and women who worked on the Apollo missions - NOT ONE PERSON - has EVER alleged that he or she was part of a hoax. Surely you must know how hard - make that impossible - it would have been to keep those thousands of people silent on a hoax of the magnitude you purport. The ONLY people who have alleged a hoax are people, with all due respect, such as you, who foist fact-less conspiracy theories on the world with no compunction about not having ANY substantive, evidence-backed basis for those theories. There is NOTHING compelling about your arguments, Wolfgang. You marshal NO evidence. You offer NO facts. You ask a few questions and then offer partisan political philosophy that is irrelevant to the specific, factual question of this thread: Did we land on the moon? Your posts on this and other matters - strangely, not on the Trinity, however - leave little reason not to conclude that you have some genuine affinity for conspiracy theories. I find that disappointing. It also seems a common thread of people who hold to this conspiracy are people who hold to other crazy conspiracy theories such as 9/11 and the Kennedy assassination.